This potato salad is like a collection of all of the foods I used to hate. But don’t get me wrong, it tasted good for other reasons, too! After my defense a few weeks ago, I (skipped my friend Brendan’s defense and) went home to take a nap. On the way home, I stopped at a little sandwich shop, which I love for its abundance of ‘homemade’ pickled-things and its reliance on local farms for nearly all of the ingredients. I ordered my favorite sandwich there — a lemony, avocado-y, hummus concoction — but was so hungry, so tired, and so elated that I realized just a small sandwich wasn’t going to cut it. So I also asked for a little container of the potato salad on their counter — the potatoes seemed impossibly perfect (for cooked potatoes), still in little cubes, not disintegrating around the edges at all, and there was whole-grain mustard slathered over the potato cubes — no mayo in sight. To fill the few seconds of silence while she was scooping up the potatoes, the woman behind the counter asked me how my day was going so far. I couldn’t help but answer with more than she probably wanted to hear: “pretty good — I just defended my dissertation, 30 minutes ago!” Rather than taking my TMI bragging as obnoxious, she started congratulating me and gave me a free container of farm-fresh ripe strawberries! If finishing my PhD after 7 years hadn’t already made my day, then that would have. It was also pretty wonderful getting to go home, eat this salad, and take a pre-celebration nap. 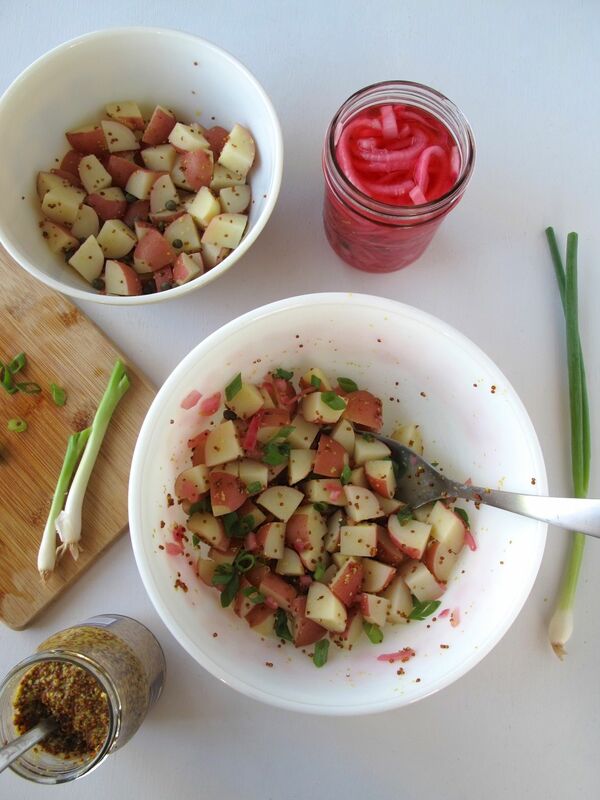 This is no ordinary (i.e., mayo-y) potato salad. 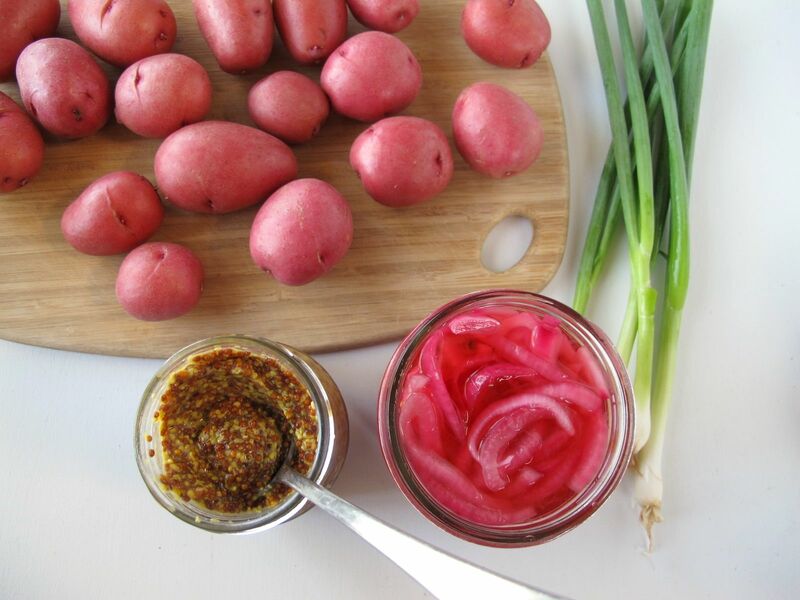 The whole-grain Dijon mustard wakes up the vinegary potatoes in ways that mayonnaise never could. 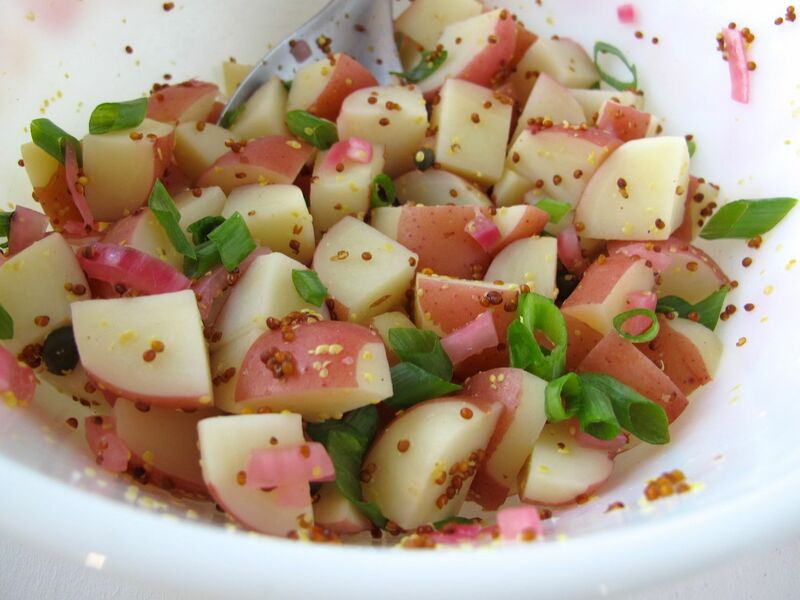 The entire salad is tangy and bright — the tang comes from a vinegar triple threat: vinegar in the potato-cooking water (for flavor that seeps into the potatoes), vinegar to season the potatoes while they’re still hot from being simmered, and the vinegared crunch of the homemade pickled red onions (recipe below!). 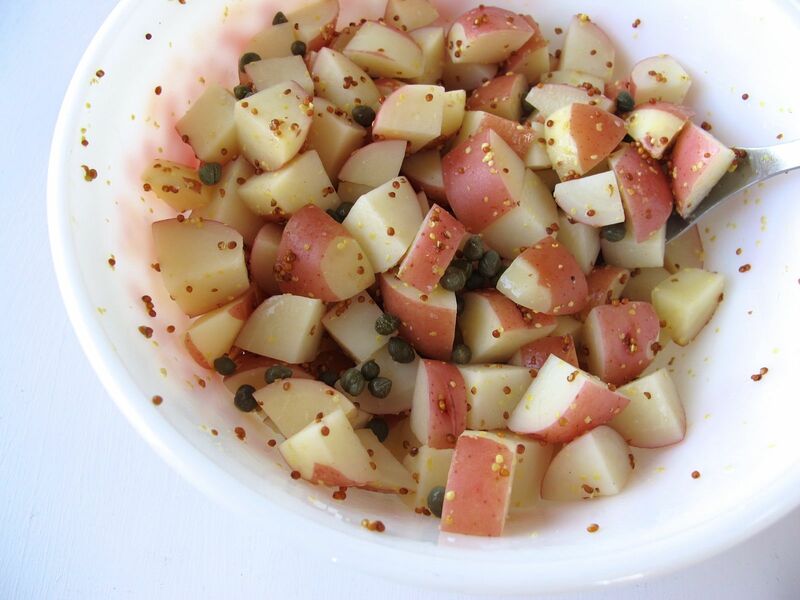 The capers add a briny salty seasoning and the pungent mustard holds it all together. I don’t think I noticed the capers dotted among the potato cubes in the sandwich shop’s version until I got home. Capers are easily pick-out-able, so I wouldn’t have minded anyway, but as I ate the salad, I realized that I was actually kind of enjoying the little bursts of salt and vinegar they added. The salad also had bright pink specks of pickled red cabbage or pickled red onions — really, either one would be nice. 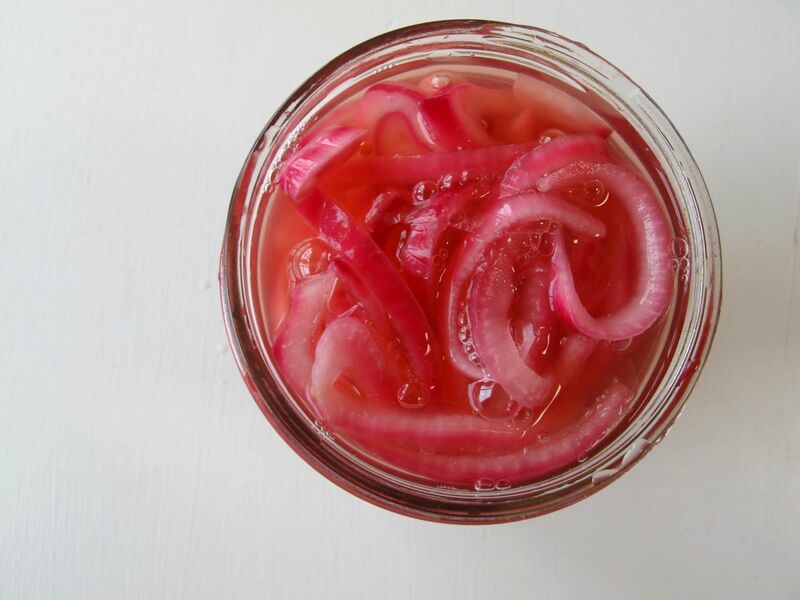 I’ve included a recipe for quick-pickled red onions below. I made a big batch of them over the weekend (1 red onion, 1 pint jar), to last me for multiple batches of this potato salad! In re-creating this recipe, I realized that the secret to the perfect little non-disintegrating potato cubes is not to let the potatoes come to a rolling boil, but just to keep them at a strong simmer, for a slightly longer cooking time than if they were boiling. So the recipe is a little bit high maintenance in that sense. But if you don’t mind your potato salads on the mushy side, then by all means, boil away! 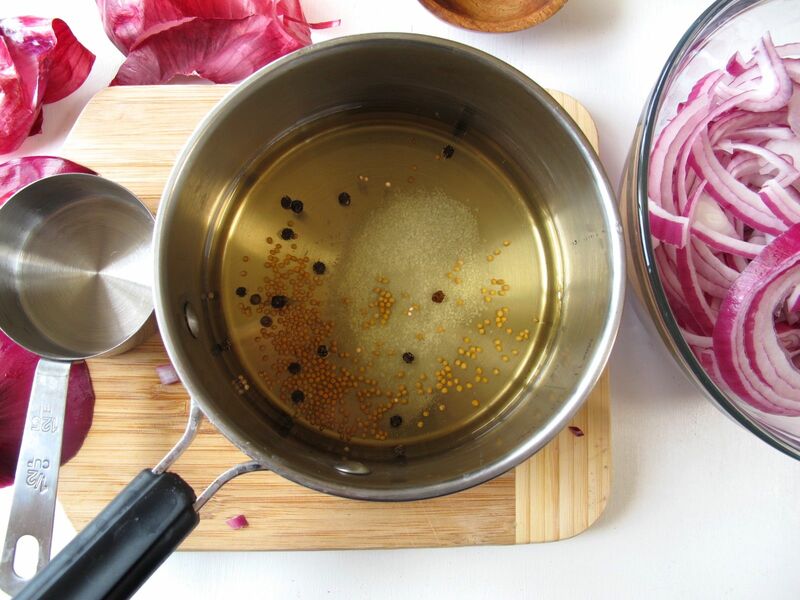 I hope everyone who enjoys the tang of mustard and vinegar will give this dish a try. I think it’s going to be a summer staple around here. …although it might never taste quite as delicious to me as it did on the day of my dissertation defense. That day it tasted like freedom and victory! Active time: 10 minutes; Total time: at least 1-2 hours, or overnight. 1. 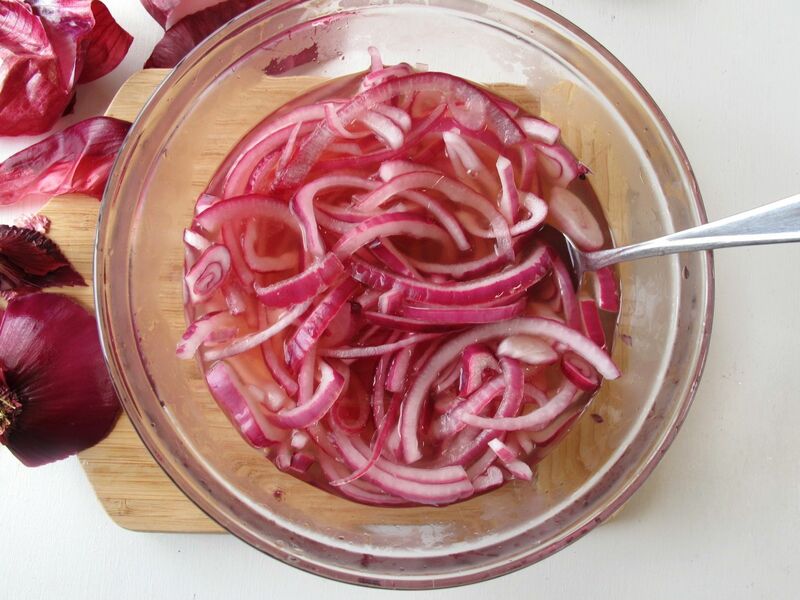 Remove the outermost layers of the red onion, and thinly slice it. 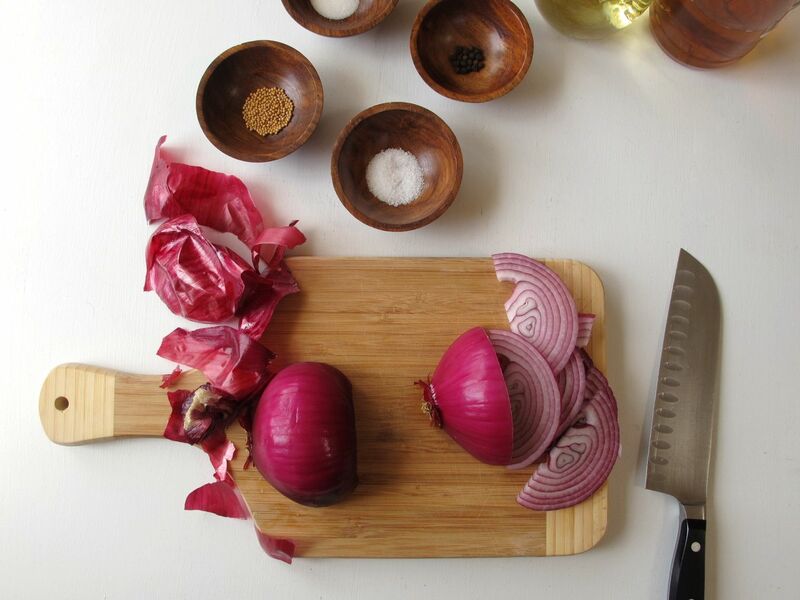 Place sliced onion into a glass, heatproof bowl and set aside. 3. 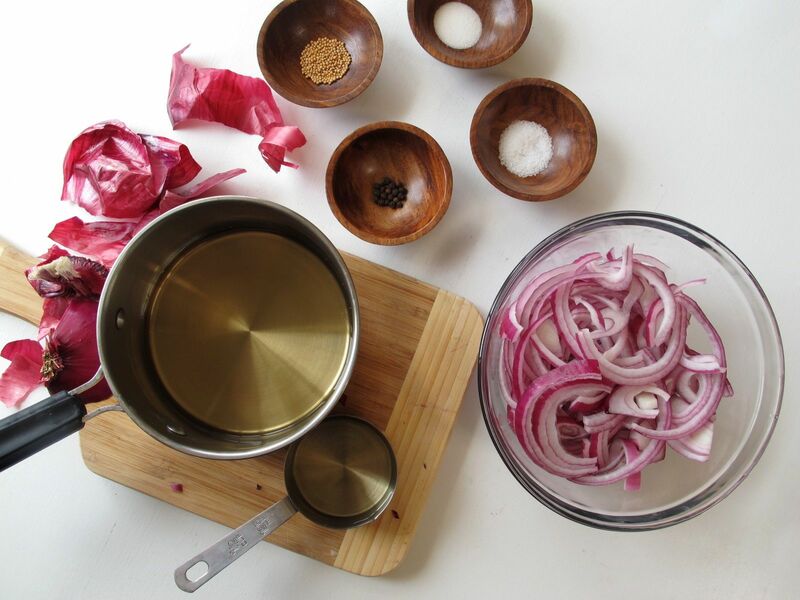 Once cooled completely, transfer the onions to an airtight container — along with enough of the pickling liquid to cover them — and refrigerate. You can start snacking on them after an hour or two, but they’ll be even better after a night in the fridge, and good for a week or two after that. Active & Total time: 40 minutes (includes ingredient prep time). 2. While the potatoes are simmering, stir together the whole-grain mustard and the 1½ – 2 Tbsp. vinegar in a medium bowl. 3. 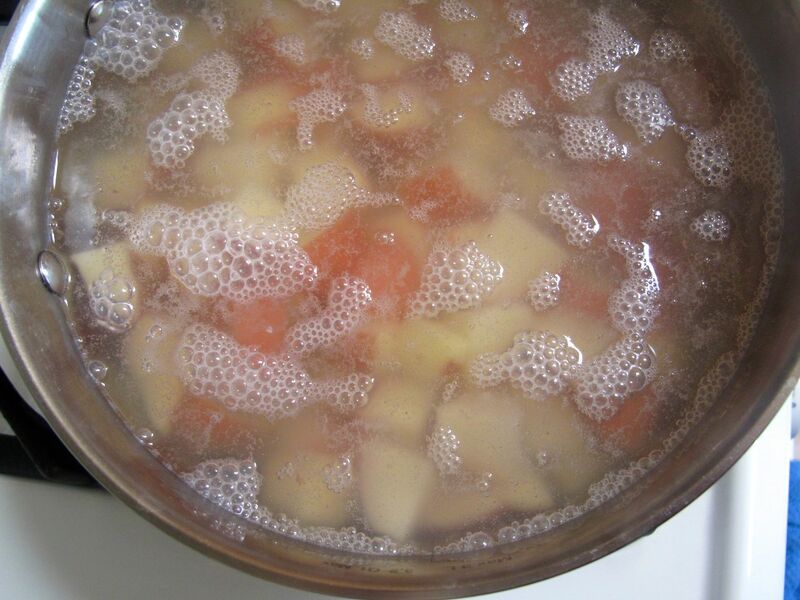 Once the potatoes are cooked, drain them in a colander, but do not rinse them with water. 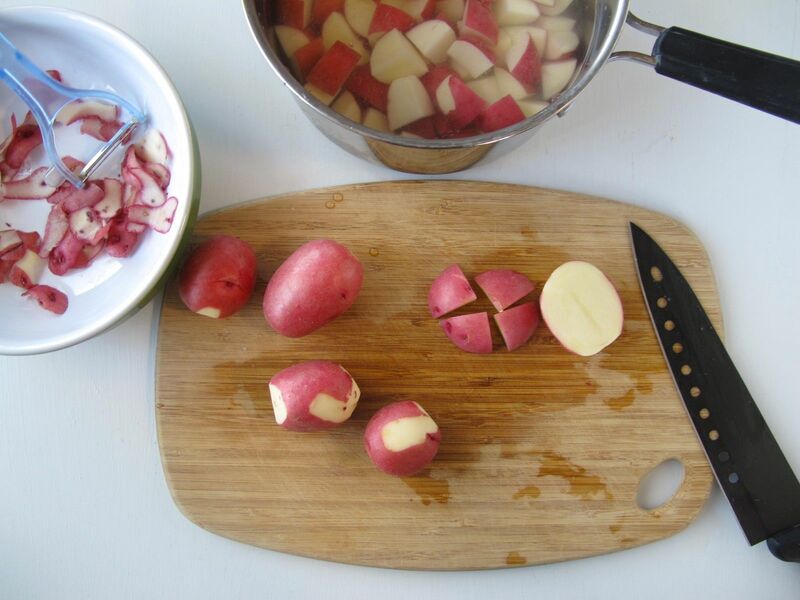 While the potatoes are still hot, pour them into the bowl with the mustard and vinegar, and gently stir to coat them. 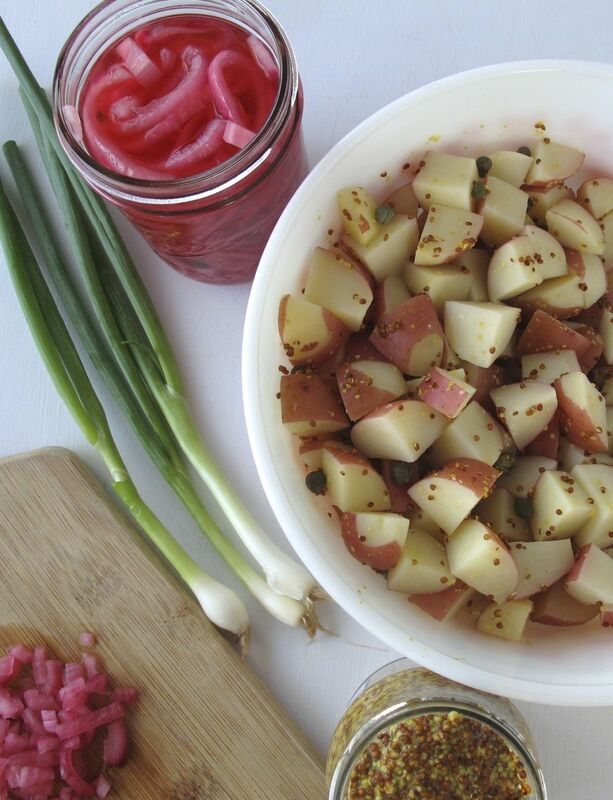 Season with salt, and add pickled red onion, capers, and scallions. Taste to see if you’d prefer to add more salt or more of any of the other ingredients, then cover and chill in the fridge. Love it! I also used to hate all those things, and now I love them. 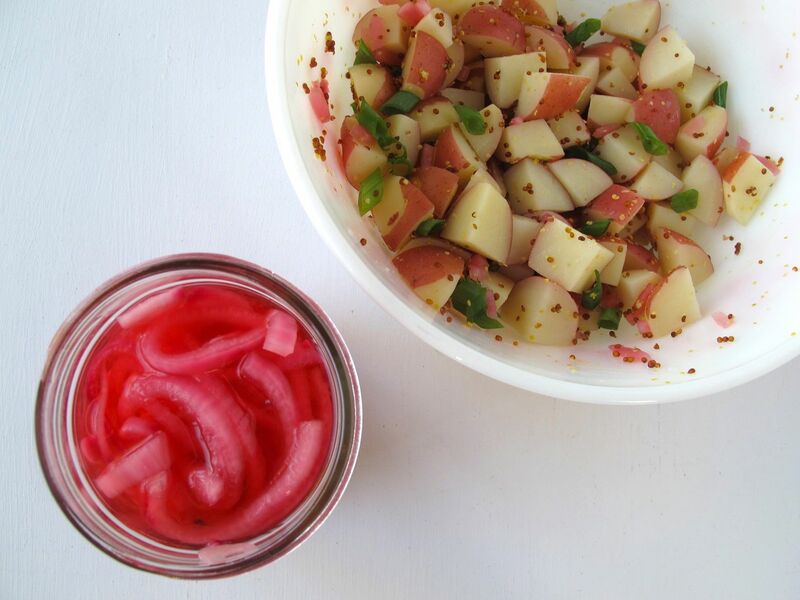 I used to hate potato salad, but now I love it, and yours looks delicious, especially with those beautiful pickles. So simple, and yet packed with flavor and healthful. Perfect for the warm weather we are having too! And I used to hate potato salad, too! I forgot to mention that! In my childhood experience of it anyway — only at picnics, since my parents never made it — it usually had way too much mayo and some unidentified flavorless crunchy things like celery maybe? Anyway, gross. 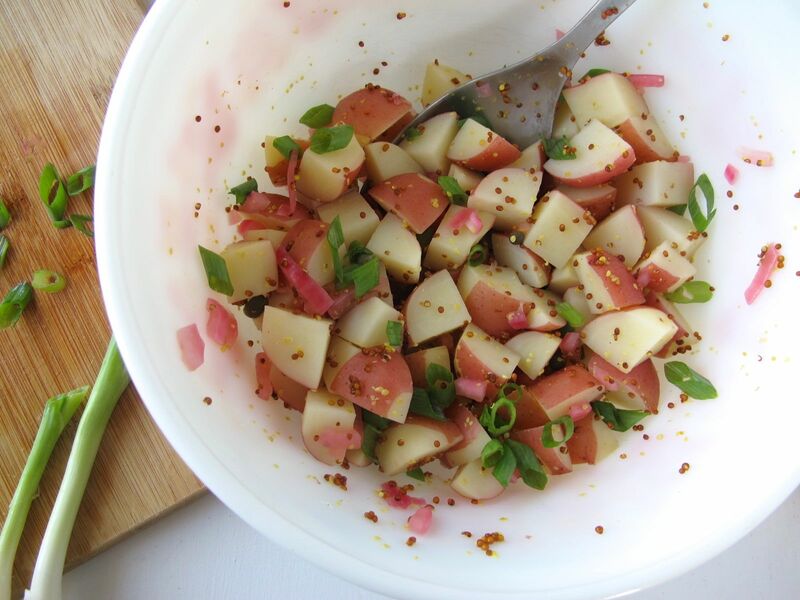 This version has re-invented potato salad for me! Hahah! Love your description of the mayo salad with potatoes and unidentifiable veg’ in it! That’s exactly how I felt as a kid (and teen, and young adult). The worst was at Russian parties; people would always bring horrible-looking salads with more mayo than anything else in them. Now I love potato salads and Russian salads, but I still don’t like those with tons of mayo, whereas mustard and vinegar : any time! I think you just have to find the potato salad recipe that you like. There are a lot of variations out there. I love the addition to capers. Love those little guys! Debbie, yes I think you’re right. And I actually like mayonnaise these days (especially the homemade kind), but I still don’t think I’d enjoy it on most potato salads… I love the straight-up vinegar/mustard combination even more. And I’m really into capers now, too! This salad (the one I picked up from the sandwich shop) is what converted me to them! I’ve already used them in this a few times, and in a pasta dish where the capers are briefly fried in olive oil, then cooked into the tomato sauce… so good. 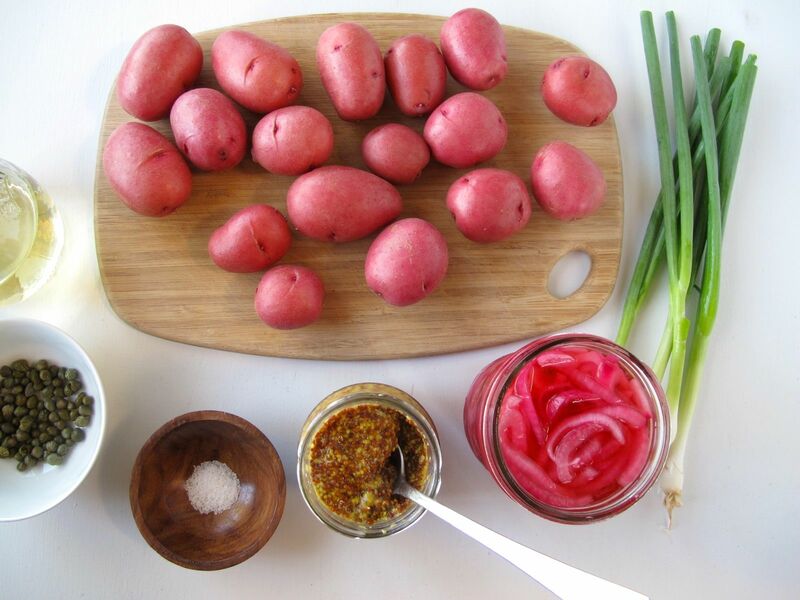 You may like the potato salad I posted last week. It uses spicy mustard and white vinegar, so it has a twang to it. 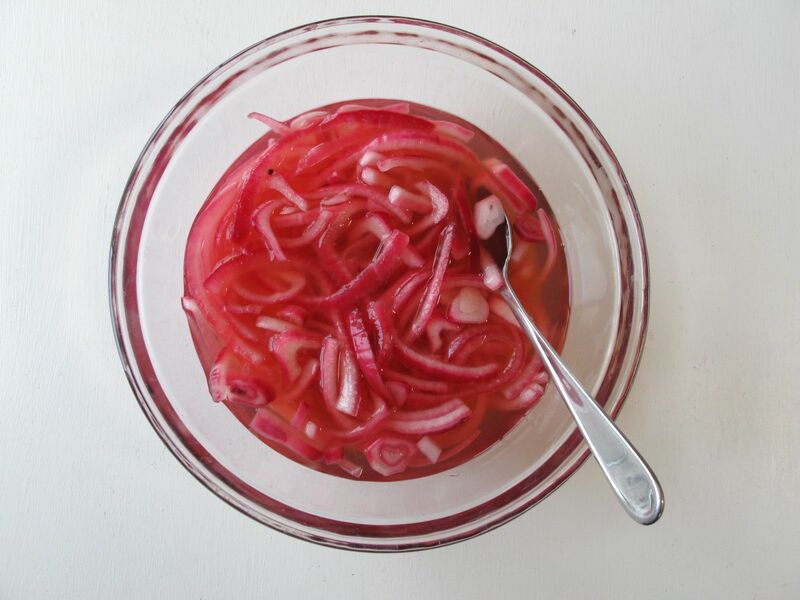 I love pickled red onions! N made kimchi yesterday, we’ll see how it turns out! Thank you! It actually got even more colorful after I *finished* taking these photos, since I tasted it again (right before I sat down to eat a big bowl of it) and decided to add even more capers and pickled red onion first. hah, I just posted a not-potato-salad potato salad! You have read my mind, and you sure earned those strawberries! I absolutely love Potatoes, cannot imagine a life that doesn’t have them. This looks fabulous. I think i could really like this one. Potato salad without mayonnaise. Yay! I love this – all of it – the bit about loving all the foods you used to hate. The story. The recipe. The photographs. But now I’m trying to remember if I ever said congratulations to you on your PhD?! What a huge huge huge accomplishment. I saw your comment on my blog about the word saudade and how much you love that and word bittersweet. I haven’t replied yet but I wanted to tell you how much I truly loved that comment and how incredibly sympatico you feel to me. 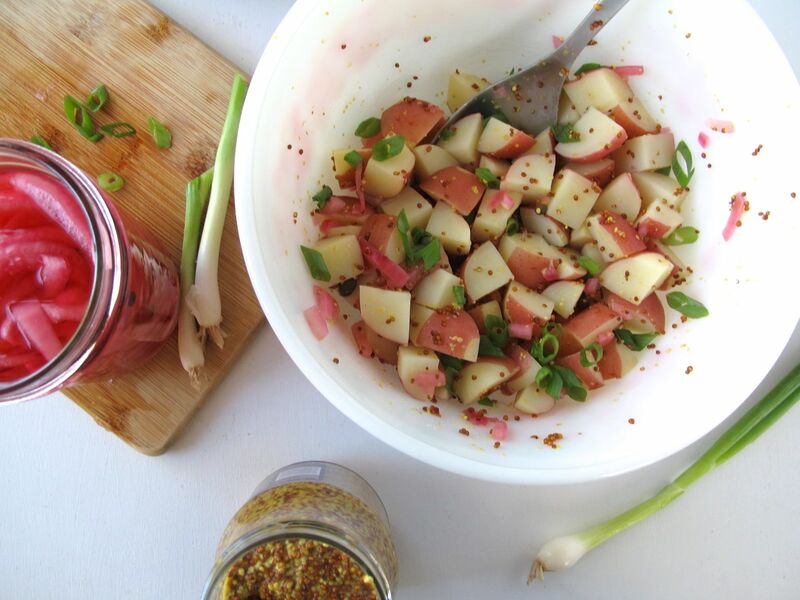 I was never a fan of the mayo-style potato salad (which my mom made all the time over the summer months), but love “German-style” with its tangy dressing. And anything pickled? Hand it over! Looks like a wonderful summer duo to me. Thank you so much for sharing it at the very first weekly Potluck :-)!